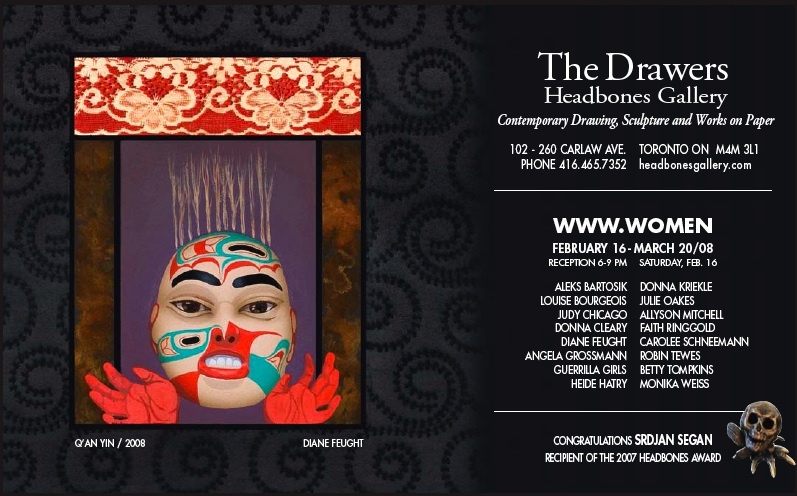 Good friend and amazing artist Diane Feught sent me this invitation to the opening for http://www.women, a significant group show upcoming in Toronto’s Headbones Gallery. Diane’s Q’an Yin drawing on the invite above is part of the “Queen of Heaven” series featured in the exhibition, while her darkly stunning Yama image can be seen here in the Press Release from Headbones Gallery. This promises to be a powerful exhibition, with work from Aleks Bartosik, Louise Bourgeois, Judy Chicago, Donna Cleary, Diane Feught, Angela Grossman, Geurilla Girls, Heidi Hatry, Donna Kriekle, Julie Oakes, Allyson Mitchell, Faith Ringgold, Carolee Shneemann, Robin Tewes, Betty Tompkins, and Monica Weiss.